Icewine, that delicate, sweet elixir, crafted from wine grapes that are allowed to freeze on the vine, originated in Germany in the late 18th century. Today, however, the world's best icewines come from the wine regions surrounding the Great Lakes, including Ohio's Lake Erie wine appellation. Icewine results from a process, not a single grape varietal. Various grapes are used to make icewine. In Germany, the favored grape is Riesling; in Ohio and Canada, the Vidal Blanc grape is favored. 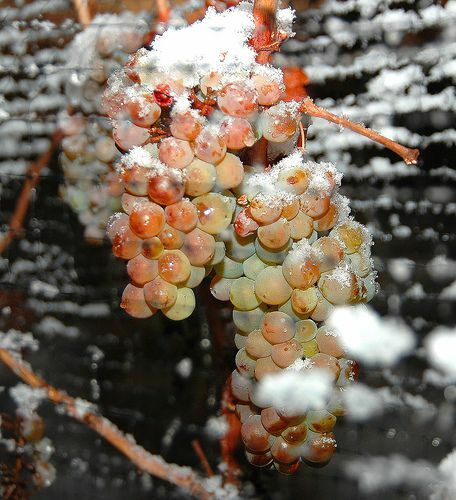 Other grapes used in icewines include Seyval Blanc, Cabernet Franc, and Shiraz. Icewine is the product of allowing the wine grapes to freeze while still on the vine, concentrating the natural sugars in the juice. The climate around Lake Erie is ideal for making icewine. The warm lake protects the vines until the first hard frost, which generally occurs in early December. The grapes are then harvested and pressed immediately, while still frozen. Laurello Vineyards, in Geneva, makes a Vidal Blanc icewine. Ohio icewines are available at regional groceries and wine stores as well as directly from the wineries. Ohio wine laws currently prohibit individual wineries from selling directly to out-of-state consumers. Please note that icewines are traditionally sold in 375 ml. bottles.